Best Router Lift Reviews: Who Makes The Top Router Lift? Making bit changes in a router suspended below a router table can be a real pain in the you know where. Each time you change your bit, you'll need to reach under the router table, disengage the router motor, lower it, and change the bit. Then, you'll have to reinsert your router motor, adjust the height, then lock it in place. Quite a tedious task for sure. Not only are you losing time doing this, you're also stressing your back, knees and other places. Imagine life with the best router lift on the market. First off, you don't need to reach under the table anymore to change your bit. Everything happens above the router table. Simply cranking the lift, using the crank handle provided, will raise the router bit above the table so that you easily disconnect the bit and replace it with another one. Then, voila! You lower the bit to the desired height using the crank handle of your router lift. How much more convenient and time-saving can this be? Let's start off with the INCRA Mast-R-Lift II Router Lift. For the smoothest operation consider this the best router lift for the money. 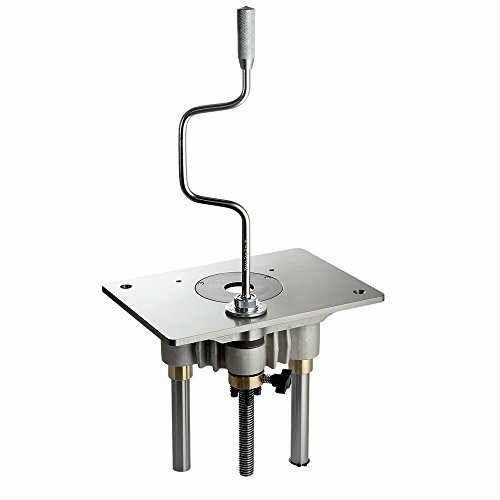 This router lift allows you to raise and lower your router bit with complete precision. This enhanced router lift is equipped with five ball bearings that are sealed on the cam lock and lift screw. This system gives your router lift a smooth and low-friction operation. It's so easy to operate your INCRA Mast R, you can, with one finger, crank up the heaviest routers. That's because the quarter-turn cam lock operates from above your router table and with the crank you can eliminate drifts in height. Also, expect continued reliability from this new model of router lifts. A really thoughtful innovation on the Mast-R-Lift is a lock that you can activate to prevent accidental height changes. This router lift also has two lateral adjustments to secure the router lift to the router table. There is also a built-in option in the Mast-R-Lift to mount various different routers. One of the best features of the Mast-R-Lift is the very robust lifting mechanism which shows off its superior design and construction. Indeed, the rigidity of this router lift and its adaptability to different routers is another compelling feature of this router lift. If you’re on a budget, then this next router lift may be just what you can buy without hurting your pocket. The Rout-R-Lift II is another quality product by JessEm Tool. Not only is the Rout-R-Lift II the best router lift for high performance, it is designed to work with several well-known and popular routers. You’ll find this router lift quite easy to set up and use on your router table. One of its best features is its precise height adjustment which allows you to easily access and change your router bits. This router lift is also smooth to operate. You might find this router lift to be very robust with a capacity to handle almost anything you can throw at it. 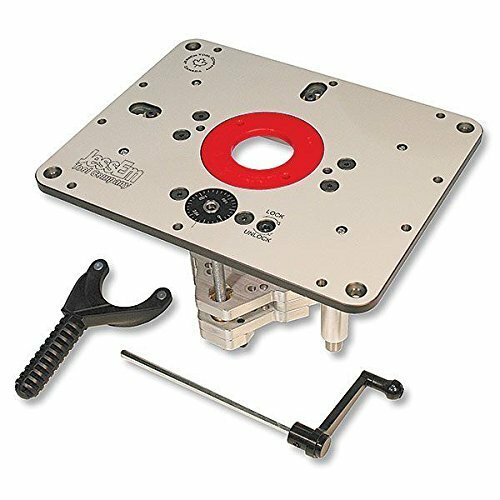 You might wish to prepare your own template to cut mounting holes because this router lift does not come with such a template. Very easy to adjust height. The first thing you’ll love about the Bench Dog Tools 40-150 ProLift Router Adjustment System is how fast and accurate it is. Accurate to within a thousandth of an inch, this router lift makes it easy to adjust the height to whatever range you want. No doubt, this candidate for the best router table lift title is unparalleled in speed and precision. Features are also designed for your convenience. Making your bit changes is as simple as removing the insert plate and raising the collet above the table. Another great feature is the wear resistant bronze bushings that allow the ProLift to withstand the demands of daily use. You will also appreciate the wide range of travel that this router lift is capable of. You won’t need to look further than this router lift for a well-built unit that gets the job done. It is recommended that you use this ProLift with routers that are fixed base. 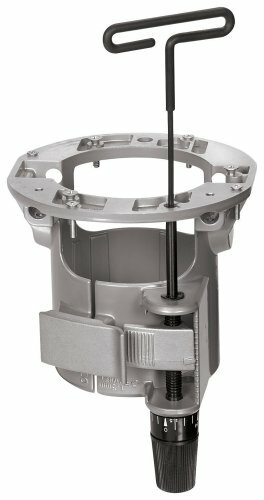 It’s a perfect fit for motor housings that are 4.2 inches in diameter, and adapters that are sold separately would be needed for routers with smaller motors. Precise and accurate height adjustments. Another premium router lift that you can certainly choose is the Mast-R-Lift II Router Lift produced by JessEm Tool. This is another of the best router lift system options to make using routers that much easier. No matter how heavy your router is, this under-the-table mounted router lift is equipped to handle it. Ball-bearings and cam lock features make a difference in the new design for this brand of router lifts. It is flexible enough to use with more than one fixed base router without compromising the quality of the routing you do. This is possible thanks to Mast-R’s one-of-a-kind clamping blocks. Equipped with 5 double sealed bearings, the Mass-R-Lift II is strong enough to provide long use even with heavy routers. Like every JessEm lifts, the Mass-R-Lift II adds tension to the threaded spindle so that vibration and backlash are removed, and accidental changes in settings while routing are prevented. That’s a great safety feature for this well-engineered equipment. Going a step further, JessEm also added a dedicated locking system to the Mast-R-Lift II to handle extended and heavy routing operations. Cranking handle and mechanical bearings allow for effortless height adjustments. Without a doubt, the Bosch RA1165 Under-table Base is one of the best router lift systems to withstand any job site and allow the professional to take control of the job to be done. If you like the convenience of accessing your bits from above the table then this router lift is just the choice for you. Its design couples the convenience of an under-table router base with an above-the-table wrench to make access to router attachments easier. This router lift is perfect for medium to large routers and is designed to be used on a router table. You’ll also find it more convenient to adjust the depth from above the table. Included with your router lift are a generous 3 -3/4 inch opening at the base to allow you to use large bits, and a motor housing that does not spin during depth adjustments. This prevents the unintended horizontal movement of the bit during adjustments, which can be annoying! The Bosch router lift also makes it easier to move your motor with its base change clamp system. 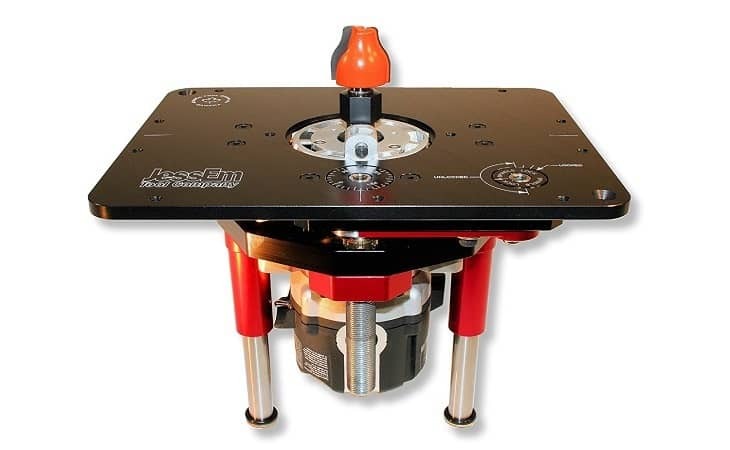 A great feature is its flexibility to be mounted on almost any router table and widely used router table plates.You may, however, find it a little tedious to unlock the router from under the table every time you need to adjust the lift height with the wrench key provided. This router lift uses stronger 10-24 screws to mount; This is a very important improvement to support the weight of routers while in operation. But, what is a router lift and why would you need one? 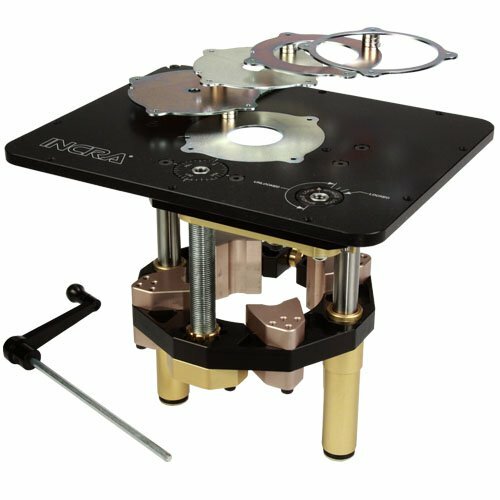 A router lift is actually a mounting plate with a carriage attached that is connected beneath the router table. The carriage is where the router is held. To complete the router lift, a crank handle that is removable is inserted into the plate to raise and lower the carriage. What is remarkable about the best router lift system is the precision you get with every turn of the crank handle. Typically, one full revolution of the crank handle results in a 1/16th of an inch change in the height of the cutter. 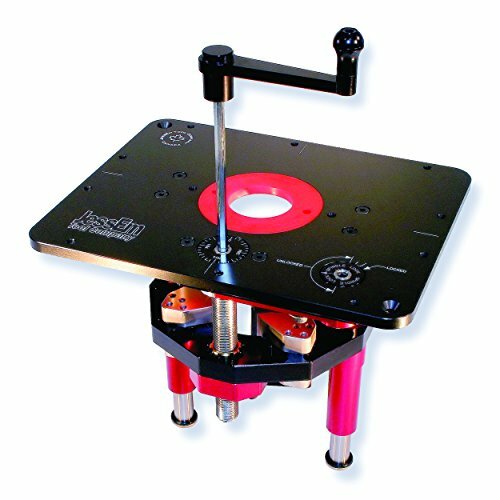 You will achieve much finer height adjustments using a router lift. See how a router lift can make your routing tasks that much easier? That is one of the reasons you really need a router lift. Here are a few considerations when choosing the best router table lift. In choosing your next router lift, or your first if you have never had one before, there are a few crucial things to consider. The basic thing is the ability of the router lift to raise or lower the router by small increments. This will allow you to adjust the router height in precise points as you do your work. Another thing to consider is the type of motor you'll be using in your router. Smaller motors require smaller router lifts. So, for larger motors, such as three horsepower or more, you'll, of course, need a larger, more sturdy, router lift. Cost may be a consideration, however, don't sacrifice quality for cheapness. It's better to invest in the best router lift system for your projects or business than to buy a cheap but inappropriate lift. The kind of router table and workspace you'll be operating from is another important consideration in choosing your router lift. The real benefit of having a router lift is the ease and convenience it provides. These are easily the best considerations in choosing your router lift. Here in our best router lift review, we'll show you the top picks from reputable suppliers of router lifts on the market. With so many high-quality router lifts to choose from, it might be a little daunting to actually select the best router lift on the market that you will be confident with. Here is where we hope our best router lift review has helped you. In making the decision to go with a router lift, what you’ll be using it for is an important consideration. Equally important is the router you’ll be using as well as the workspace and router table you will be operating from. Ultimately, a well-designed, sturdy and flexible router lift makes a great choice so that you won’t wish for anything less.